get off to a good grazing season start! 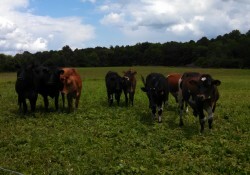 Rotational grazing is the optimum way to utilize pastures. Grazing animals are fenced into a specified sized paddock for a predetermined length of time. These numbers are based on calculations: animals eat and waste from 2-5% of their bodyweight per day in dry matter (depending on specie, stage of growth and production) and they need that many pounds of dry matter multiplied by the number of head. Shorter rotations utilize pastures more efficiently; dairy cows are generally moved to fresh paddocks twice a day and other livestock once a day to once a week. After 3 days on the same paddock regrowth will begin to be grazed by the livestock and can delay regrowth. I don't recommend continuous grazing unless there is much more pasture than the livestock can utilize. This method of grazing leads to poor quality pastures. Ideal grazing height is 8-10". Can you wait that long to start grazing? No. Wait for the grass to get some growth and take a look at the number of leaves on the grass plants, more than 3 leaves. Some research indicates to count leaves not inches! Grazing when the grass is too small will remove the growing point which will slow regrowth. Flash graze if necessary; move the animals through quickly to prevent damage to growing points. If the soil is wet start grazing when there is a quantity of pasture that will help protect the soil from hoof action. If too much pasture gets ahead of you harvest excess as hay, clip the paddocks fairly closely or bring in another group of animals. This will encourage tillering of the grass plants. Last season's residue helps to protect the soil, too. Where to start? This may depend on what ground is dryer or what pasture grasses have more growth. Some pastures may be better suited for mechanical harvest so keep that in mind when beginning the grazing season. A rule of thumb to start the season is you'll need to harvest half since the livestock can't keep up. Another option would be to graze additional livestock during rapid growth times. Keeping residual plant (what's left after grazing) height taller encourages regrowth of the taller plants. Kentucky bluegrass, annual bluegrass, less-productive clovers (think white clover in your lawn), and weeds do well under short conditions. Leaving the residue taller will encourage the more productive, taller plants to flourish and stay productive. Take half, leave half is a good rule of thumb. Rest period is just as important as residency period. Pastures need adequate time for regrowth to remain productive. Spring conditions that are cool and moist encourage fast regrowth, 10-14 days, hot and dry conditions may warrant 40-60 days. A big problem is leaving grazing animals out too late in the fall. I have been told by a seasoned grazier that one day more in the fall will be three days less grazing in the spring. Grass plants need root and rhizome reserves (stored energy) to begin spring growth. There will be little leaf material to capture sunlight for photosynthesis so energy to begin growth is supplied by the stored carbohydrates. This can't be helped now, but keep this in mind in the fall. A great way to learn about grazing is to attend a pasture walk. Those that host one learn more than those that attend, so I have been told! If you'd like to host just drop me an email!